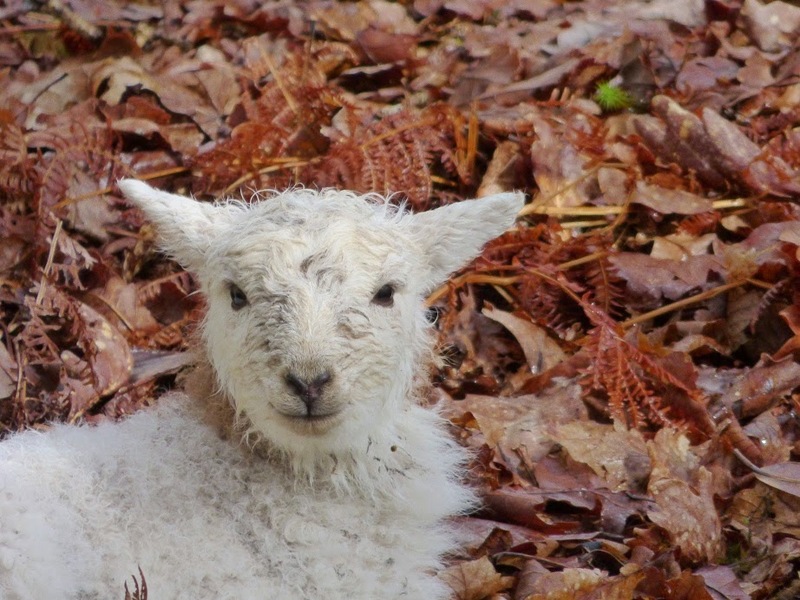 We’ve got a newborn lamb on the drive, just by the bottom hairpin and close to the kid goats. I thought our farmer would be pleased to know, but it and its mother belong to the neighbouring farm. Trespasser it may be, but what a cutie! Our other spring visitor today was a red kite. I know they’re common as muck in Bucks and Berks but for us it’s an occasional sighting, usually coinciding with lambing and the availability of food. They are often seen in Harlech or Llan Ffestiniog but rarely around us. 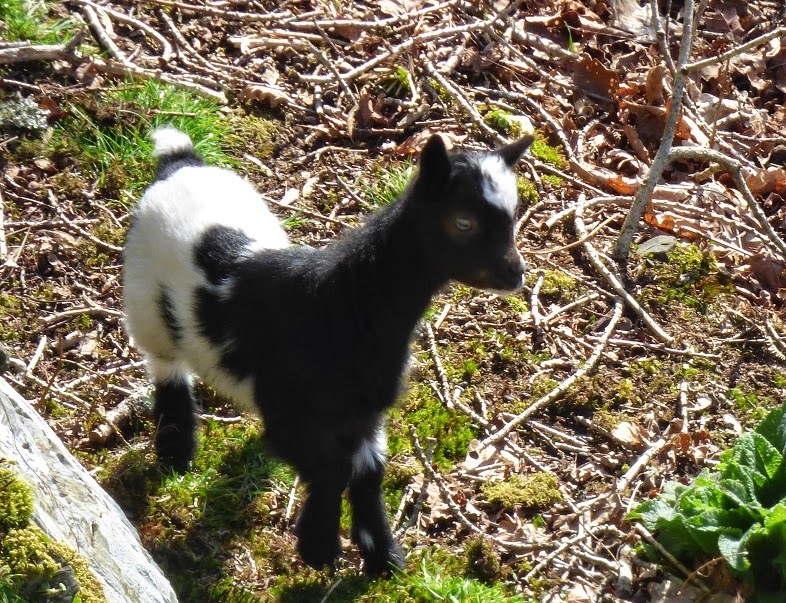 When we first moved into our house in Snowdonia there was a gang of seven wild goats to welcome us; six adults and one kid. For the first few years the population was constant. Occasionally we’d lose one to old age, or a young male would go off in search of his own territory, but new ones would be born. We called them the Below the Railway Gang to differentiate between the ARGs, the Above the Railway Gang, which have a very distinctive colouring with a jet black head and shoulders and a white rear. I’m not sure how many ARGs we’ve got as they are much higher up the mountain but several years ago we counted twenty; that was the year they had four kids. In recent years our gang of seven was depleted with successive years of no kids; was our impressive looking billy not up to the job? Inevitably the older ones would die of old age including the top billy. Months after he disappeared we found his skull and horns sticking through the snow, thirteen growth rings made him a teenager. It was not until I discovered this skull that I understood goat horns. I knew they kept on growing each year, as opposed to being shed like a deer, but I hadn’t realised that they were connected to the skull with such a long piece of bone. The horn itself is a sheath, made of the same stuff as our fingernails, that slots over the bone. 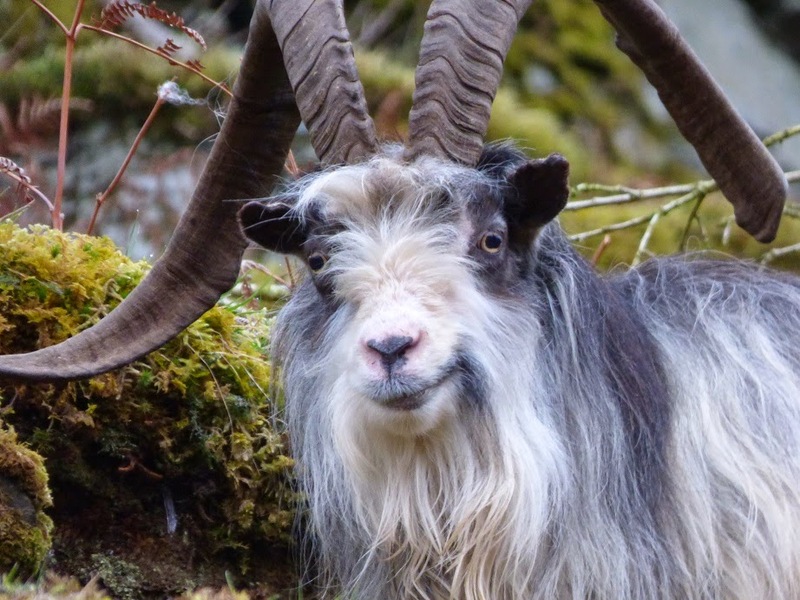 For a goat to lose a horn, which I’ve seen after the autumn rutting, it must be a serious and painful business. Thirteen months ago we were down to one elderly male and two middle aged females when out popped twin kids. We were delighted with the new arrivals and watched as they grew into sturdy youngsters. Curiously their colouring was more in keeping with the black and white ARGs than the mottled grey and white of our billy – had one of their billies crossed the line? Over the last couple of months I have been watching the behaviour of our local gang and often found them taking afternoon siestas in the cosy bracken. Then one day I found just four of them, the billy, the twins and their auntie – where was mum? Sure enough a couple of weeks later, our good friend Sandra, a keen goat watcher who was looking after the place while we were away, saw the next generation, another pair of beautiful black and white twins. long enough for a family pose. For the time being they are resident on and around a steep sided cliff towards the bottom of our drive. She’s an attentive mother, quickly ushering the kids out of site whenever cars or people pass by. Yesterday I noticed the rest of the family had come down to the cliff and had just crossed the fence on their way back into the nature reserve. For the next week or so this fence is too much of an obstacle for the new kids but soon they’ll be tearing about with the rest of the family. I hope there is no jealousy on the part of last year’s twins. So there we have it, the return of the magnificent seven – a lucky number and a modest one, which should not cause any conservation concern to the nature reserve. 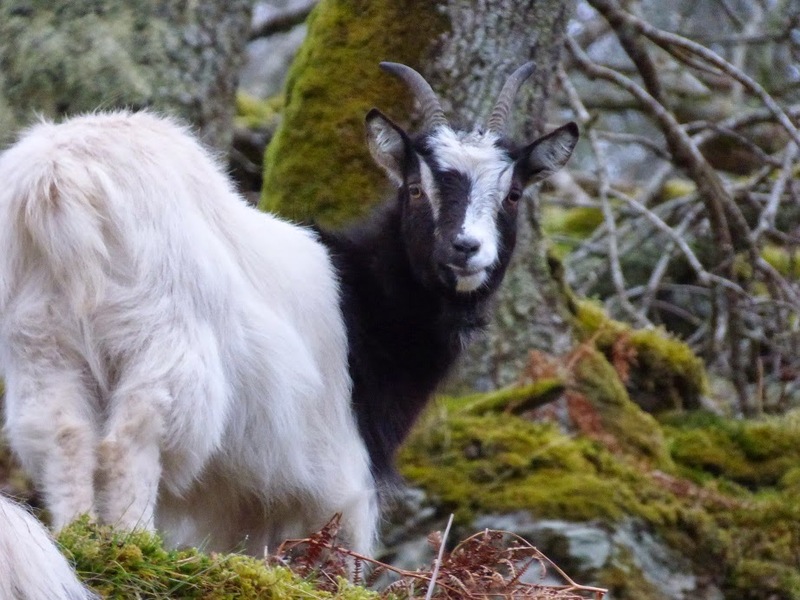 Back in the 1980s there were said to have been about sixty wild goats, that some were caught and transported to Scotland whilst others were shot. No need for drastic actions like that at the moment. 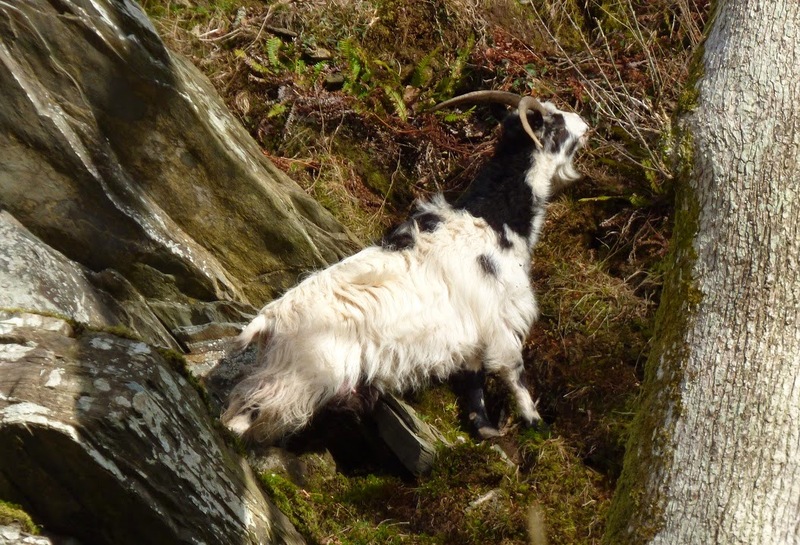 Seven goats should be about right to keep down the ivy and brambles to make good space for the lichens and bryophytes. One of last year's twins aged about 13 months.